Bonus Prize: Each kid in the class gets free admission to all the Happier FAMILY Comedy Shows occurring while the class is in session! PREREQUISITE: None! This class is open to any child-adult combo who adore each other and want to have fun playing improv games together! Sign Up on the List Below to Get First Notice When the Next Session of Family Improv Runs! When is the last time you shared a doubled-over, cheek-stretching, tears-running laugh with your loved ones? 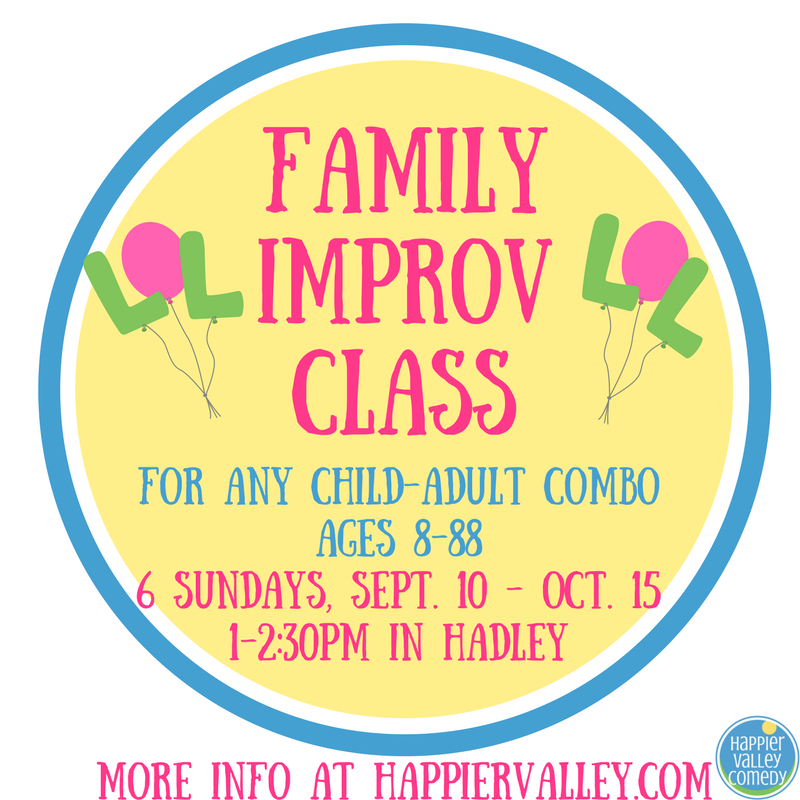 Happier Valley Comedy’s FAMILY IMPROV has you covered with a weekly improv class geared for kids ages 8-12 years old and their special adults to share the joys of improv comedy games. Regular laughter is good for your health and great for your family’s relationship. Improv also is a terrific way to practice important skills like accepting ideas from others, mindfulness, quieting judgment of self and others, communication and more. But mostly, it’s a ton of fun. So bring all your “family” members eight-years-old and up to FAMILY IMPROV! This class is open to any child-adult combo who adore each other… because we believe love makes a family! Plus, every kid in the class receives a free ticket to the Happier FAMILY Comedy Show. Laugh with a loved one and let us make your happy family HAPPIER! For more information, check out our FAMILY IMPROV FAQs below. About your FAMILY IMPROV teacher: Kate Jopson is a graduate of the Happier Valley Comedy Schools Zen of Improv classes and a Happier Family Show cast member. She loves teaching and has worked as a middle and high school educator for 5 years. Before moving back home to the Pioneer Valley, Kate studied, performed, and taught at Just the Funny Theater in Miami, FL. Life is improvised! No planning. Just by-the-seat-of-your-pants action. Well play games you may have seen at the Happier FAMILY Comedy Show or on Whose Line is Anyway? on TV. Fun stuff. And easier than you think. Improvisation is wonderful way to practice valuable skills, such as: gaining confidence, listening, getting more comfortable with making mistakes, letting go of fear, accepting ideas from others, exploring your creative self, being in the moment, and last but not least grinning, giggling and guffawing! Yay for play! Nope. Not even a little. I promise. What about folks who get nervous performing? FAMILY IMPROV is taught in an accepting, welcoming and completely voluntary atmosphere. You are invited to participate to whatever extent you feel comfortable, even if its as an enthusiastic audience member. Scaredy cats welcome! FAMILY IMPROV is a class in the Happier Valley Comedy School, which produces the Happier FAMILY Comedy Show. Happier Valley Comedy School has been teaching improv since 2013 as part of their mission to bring more joy and ease to Western Massachusetts. This FAMILY IMPROV class is taught by Kate Jopson. Love makes a family, of course! Take FAMILY IMPROV with anybody you love: parents, children, uncles, aunts, cousins, family friends, sister-friends, brother-friends, grandparents, adopted grandparent, significant others, Big Brothers/Big Sisters...anyone you love. Any adult-child(ren) combo 8-88 can take FAMILY IMPROV. Classes will be limited to about 15 people, so you get plenty of time to play lots of family-funny games. Any more questions about FAMILY IMPROV? Email info@happiervalley.com or call 413-658-4615. THE LATEST ON KID-SPECIFIC OFFERINGS AT HVC! ​are invited to attend class together"
"Family Improv gives families the opportunity to laugh with a loved one and bond over fun improvisation games and exercises. The Family Improv curriculum is guided by the principles of acceptance, mindfulness, quieting judgment of self and others, and strengthening communication, all while having a blast playing together."